Hello Fall! It’s nice to be back and sharing a fun recipe! I feel like Fall brings a different kind of warmth and excitement as Summer fades away! With Fall comes the holiday season that draws us all closer together! It’s a great time to let the people around you know that you care. That’s what has inspired this post today! I’m sharing a recipe for Meltaway cookies! You’re welcome! I made these cookies to say thank you to some friends. I had to package them up pretty quickly so that I wouldn’t be tempted to eat them all myself. They are that good!! I paired them with the gorgeous printables from this Sunshine Kit by The Dating Divas. 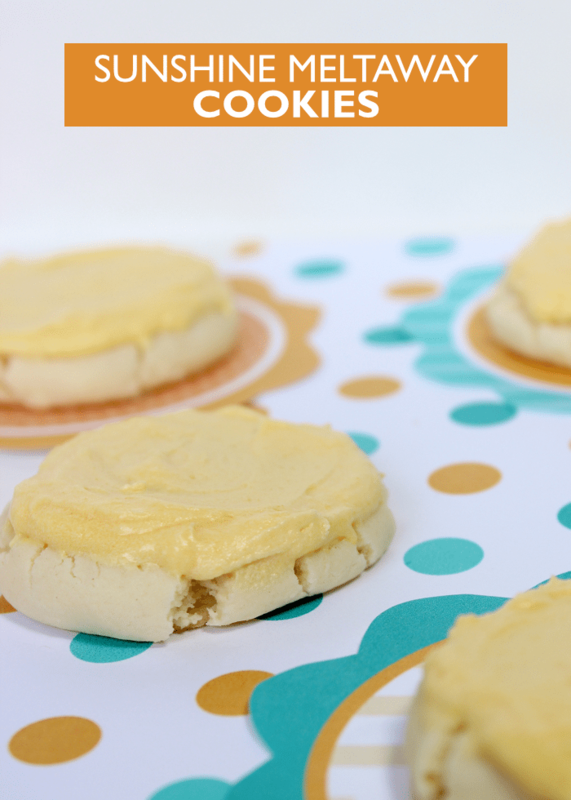 These are the best cookies to take to a friend or neighbor to cheer them up! The cookies are easy! They only have 4 ingredients, they come together in minutes and they are so soft and delicious. Remember what I said before about them being tempting?? In a mixer, cream butter and sugar until fluffy. Add cornstarch and flour. Make sure it is mixed well, but don’t overmix. Roll into balls and drop onto a cookie sheet. I like to flatten them slightly with the bottom of a glass jar coated with PAM. While baking, mix butter, cream cheese sugar and vanilla together well to make your cream cheese frosting. Let cookies cool and then frost and sprinkle with the sprinkles of your choice! Come on over and visit my site Messes to Memories for more fun Fall recipes and ideas! So easy and yet so delicious! I’m going to see my daughter at college next weekend and these are making the trip. Thanks for the great recipe! !